Rett Syndrome is named after Andreas Rett, the paediatric doctor who first described this neurological disorder in 1966. However, the syndrome was not generally recognised until later, when a second article by the Swedish researcher Dr. Bengt Hagberg was published. The syndrome is caused by a genetic mutation within the X chromosome, and in the vast majority of cases, is not inherited from either parent. Is it thought that in some rarer instances, the syndrome can be inherited from the mother. Rett Syndrome tends to only affect girls, and manifests itself after a period of normal early development. It is very rare for male foetuses with the disorder to survive a full term. Typically, between three months and three years, the child’s growth and development will begin to slow down, with the head and brain (grey matter) growth also slowing. In the very early stages, as development may appear relatively normal, the disorder can be overlooked until developmental progress becomes noticeably delayed or regressed. Subtle signs of the disorder might begin to present after three months – hypotonia (loss of muscle tone) and erratic or juddering limb movement and difficulty feeding could prove early indicators. Apnoea (breath holding) and hyperventilation may begin to emerge during the early stages of the syndrome, and as the child ages, emotional and intellectual developmental problems such as anxiety, social behavioural problems and learning difficulties will become more apparent. Other characteristics of Rett Syndrome during the early developmental period may begin to become more evident. Apraxia, or the inability to perform motor functions – can become the most limiting symptom of the disorder. Hand wringing and spasmodic hand movements, avoidance of eye contact or an inability to retain a gaze may also be noted. The mental and physical disorders arising as a result of this syndrome might include almost a regression in walking or crawling, a gradual or sudden loss of purposeful use of the hands, such as an ability to grasp objects, reach or touch and even a regression in any speech developments. Children with Rett Syndrome may also show certain behaviours that have lead to the syndrome being described as one of the autism spectrum disorders, although this classification remains controversial. 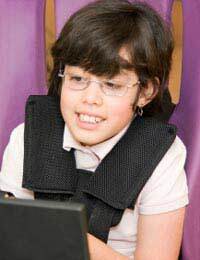 Other problems common to those with Rett Syndrome, but not exclusively related to the syndrome, are seizures, scoliosis, gastrointestinal problems such as constipation, cardiac disorders, difficulty with chewing, swallowing and feeding, and problems with sleep patterns. The different stages of Rett Syndrome have been described in four stages. During the first early onset stage, development begins to slow or stop. In the second stage of the syndrome, developmental skills begin to regress; this can include loss of speech and purposeful hand movements. The third stage is known as the plateau phase, where regression begins to slow and in some cases, problems may improve or lessen to some degree. The majority of people with Rett Syndrome spend their adult life in this phase. However, there are those that may lose mobility, become stuff or experience muscle deterioration during a fourth phase, known as the late motor deterioration phase. There is currently no cure for Rett Syndrome, and treatment for the disorder is symptomatic as the syndrome may present differently from person to person. Many symptoms and manifestations of Rett Syndrome mean that those with the disorder may require a moderate to high level of day-to-day support from carers and families. Specialists and occupational therapists can provide additional support which will have been shown to improve the general health and wellbeing to those with the syndrome.